"I think that Hillary did an excellent job as secretary of state. I think she is very, very qualified to be president," Trumka said at the breakfast, which was hosted by The Christian Science Monitor. "We watch every single day. And my thoughts are it is too early to say. There is no there, there yet." Despite being laudatory, Trumka's comments should not be seen as an early endorsement of Clinton. "Would I say she is the favorite now? Yes," he said. "But I think anytime anybody believes there is going to be a coronation, that is dangerous for the candidate." 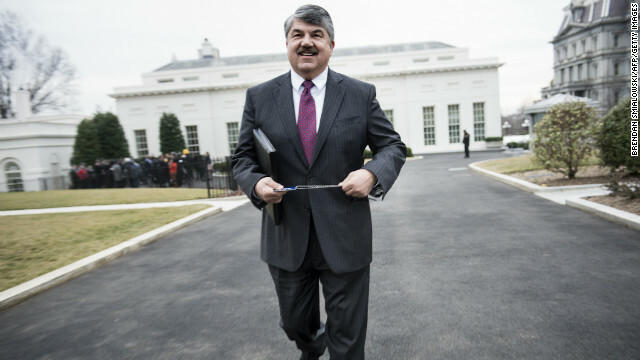 The AFL-CIO recently came to an agreement with all its member unions that "no one will endorse [in 2016] until we say all of us are going to endorse," Trumka said. Before doing that, the group wants to know where candidates stand on raising the minimum wage, tax code reform and trade issues. Trumka said his group will be questioning all presidential candidates in order to make their endorsement and will be looking in particular at the candidates’ economic advisers. "One of our biggest concerns is who the candidates economic team is," he said. "If you get the same economic team, you are going to get the same results and the same results aren't good enough for working people." Support for The North American Free Trade Agreement, an agreement signed by former President Bill Clinton in 1993, was among the top issues Trumka said his group would look at as a negative. Also on that list were support for "tax codes that favor sending jobs oversees" and "people who think Wall Street are the be-all and end-all." The AFL-CIO did not endorse Clinton when she ran for president in 2008, but the group waited until the primary was nearly over to back her Democratic challenger, then-Sen. Barack Obama. Other unions were split between the candidates during the contentious primary. Earlier this month, AFL-CIO Political Director Mike Podhorzer told reporters that the group was withholding judgment on Clinton for now, according to The Hill. Clinton was not the only possible 2016 contender that Trumka spoke highly of, however. The labor leader also said Sen. Elizabeth Warren was one of the labor's most supportive friends in the Senate. And uh how is members voluntarily giving monthly dues stealing, sorry pal but I know enough to tell you your full of it. And fyi, the only case of stealing union members fees Is hostess, but hey what would I know, I've only been on a union board for ten years. And limiting personal campaign contributions is an infringement on ones freedom of speech, but fining a union and its members for picketing is not, and the gop proposed giving the 10,000$ a day fine to the company being picketed, that's only fair right, wrong, its illegal for a reason. You gop may win a few more battles, but the fact your desperately trying yo restrict the vote means you know it too. The AFL-CIO approves of Clinton, Im shocked. These crooks take a chunk from their members paycheck then claim to fight for their members well being. They"ll fight and then tell you the bad news that you only get a five cent raise. The AFL-CIO is nothing but a Democrat lobby group. That AFL-CIO thingy you speak of so disparaging, smith? It helped drag my parents out of poverty and bring my family into the middle class during my growing up years. It also helped me pay for our cabin by allowing my husband's union salary to go towards our mortgage; our daughters schooling; health care payments - and other "essentials" of raising a family - as well as, but not limited to, payments towards our cars, boat, and retirement over the years. My non union income was duly saved and then put toward the mortgage free "pleasure" of owning that little bit of "lakeside cabin wilderness" I've come to enjoy during my retirement. It truly saddens me that not everyone in America will be given the same opportunities that I and my family were given over the years. Retirement itself has become a past glory never to be achieved for far too many of our young just starting out in life. Democrat Party & unions. Both vast criminal enterprises. The new face of the mafia. Take your money for their own purposes, force you to buy something, disregard the Constitution and the role of Congress. and then use their Guido called the IRS to attack, harass and intimidate you if you got a problem with what they are doing. Nice rant. Too bad it isn't fact based. At least he didn't call Hillary ...."Porky". Yeah, I know...."the famous "War on Women" WOW! Amazing, I've not heard on rwnj on here post anything even close to the truth regarding unions, I'm betting most of you enjoy workers rights earned by the blood sweat and tears of our grandfathers. Grow up unions are voluntary by both the owners of the company, and the workers, yet you act like its an evil organization, CLUELESS!!!. Trumka is the symbol of organized crime in labor, and endorsement of Hillary, means we should REJECT Hillary, because organized crime is endorsing her. Hostess robbed the union, they blamed them for their failures as managers. And most don't know do I'll tell you, the court ruling allowed them to have to no collateral for the money they collected in union dues but were never sent to the union. They had an offer, more lucrative than the one accepted, but that company wanted to keep the union, they knew that wasn't the problem, several other offers had the same proposal. I could go on and on, what liberal media outlet did I get that from, Forbes. After much checking it is pretty smart for Trumpka to not endorse any one yet for President! Guess who is going to be your next President! Mitt Romney! He says he isn't running and that is true but there is going to be a Draft Romney Movement! And Romney knows what he is doing, not like the one in there now. The Polls are already showing who they want. The Unions have mostly gone the way of the DoDo Bird. But it isn't about Unions, it's about the Economy. Well, they are only to the extent that Republicans and the Right are in it only for the rich. Consider the GOP opposes: equal pay for women; livable wages; increasing the minimum wage; corporate retirement programs for the rank and file; employee health care programs for same; are firmly attached to the notion of killing SS, Medicare/Medicaid; are philosophically opposed to the Dept. of Labor -which exists to ensure safe working environments and more. Perhaps if the Republicans actually worked for the Middle Class, and to reduce poverty, unions might support them too (as has been the case in the past) . Ever think of that? Baseless rants just mean they are out of actual facts and the truth is just not good enough. Is this the same corrupt idiot that said all TEA party members should be killed? A classic clueless, greedy democrat liberal who should be up on charges rather than being trated like royalty by the most corrupt, inept, incompetent president in history. Translation: once Hillary is in, the Unions will be living high-on-the-hog. Screw businesses trying to grow and get the economy running. Screw the employees that unions are "helping" (through large membership fees, bullying if you are not in or want out, etc.). Hillary/Corzine 2016!!! State Dept loses $ billions/MF Global swindles $ billions... Just wait till they can pillage the US Treasury. Maybe you need to open your eyes a little? @ not so dumbed down.....I was a union worker for 10 years. I don't know where you gather your info but the company I worked for was forced into unionship .....kicking and screaming. Lets revisit the term...."CLUELESS"
""democrats turn workers into couch potatos with paid benefits and healthcare, curtesy of those who still have a job." LOL. I haven't watched FOX in a decade or so, but please tell me that surely even the mighty Sean Hannity doesn't go this far in his drivel of talking point nonsense?" Nope. Not that far. FURTHER. Good example recently is his nonsense about Ferguson, talking (irrelevantly) about how he would be "honest" and calmly inform an officer who stopped him that he was armed and lift his shirt to display the weapon for the officer to see etc., as if to illustrate how Brown was at fault for "getting himself shot." Please remind the class Klutch- just what has the GOP done for the economy since they wrecked it in 2007? @Lynda-My grandparents had a lakeside summer home for more than fifty years and they weren't members of a union. Point being, you don't need a a union to accomplish personal goals in life. The town in Ohio I grew up in had ten factory plants ten years after I graduated there was only Dupont and GP. Those eight collapsed under the stress of unions, like a lot of factories in Ohio have. @Longtimer-Your preaching to the choir. Im not a Republican and I think they do just as much harm for the working class as Democrats. And bet he didnt want to buy her book either..
@Lynda-My grandparents had a lakeside summer home for more than fifty years and they weren't members of a union. I suspect you glossed over the part where I mentioned poverty. My paternal grandmother was raised in poverty (she alone lived through the post depression era - my maternal grandparents died before I was born, while my paternal grandfather - a transient - was committed to a state run hospital until his death). My mother and my father were born into poverty. Neither completed high school. My brothers and I were born into poverty (indeed my own birth ended in past due collections from the hospital I was born at). My mother AND my father struggled for many, many years until such time as both were accepted at a major manufacturing plant here in Minnesota. There was NO other alternative for them to escape that which they were born into. History is once again repeating itself, and not for the betterment of society. @Lynda My grandparents weren't born rich and my father was from a really poor family. I understand what are you are saying with regards to not having much of a choice in work. My father faced the crossroads of either having to work multiple jobs and go to college or go work at a factory. He went to college.